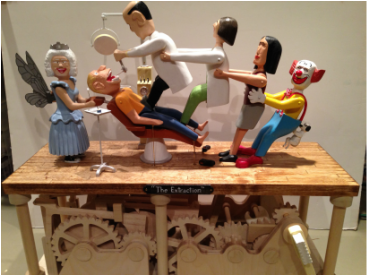 The Story of "The Extraction"
Let's face it, very few of us enjoy going to see the dentist. "The Extraction" is one of those scary scenarios we occasionally envision where an extraction of a tooth proves to be difficult and likely requires lots of pulling and lots of pain. The dentist, Hal O'Tosis is assisted by a hygienist, Ginger Vitus, the receptionist Lima Peru, and a birthday clown named Molar who just happened to be passing by. Of course wherever Molar goes so too does his little dog Bicuspit who is also helping out. The tooth fairy gleefully watches the proceeding in anticipation of a delivery to Marvin's house this evening. Hal's methods and equipment are a little antique and Marvin shakes with pain on each tug on his stubborn tooth. This ordeal has finally caused Marvin to reconsider further use of Hals services in the future! ​Click here to see more media in "The Extraction" Gallery.